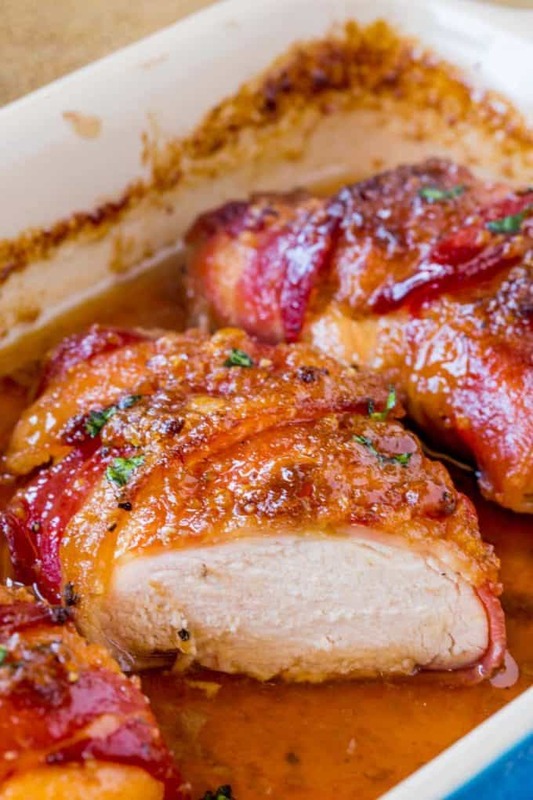 Bacon Brown Sugar Garlic Chicken, the best chicken you’ll ever eat with only 4 ingredients. Sticky, crispy, sweet and garlicky, the PERFECT weeknight meal. 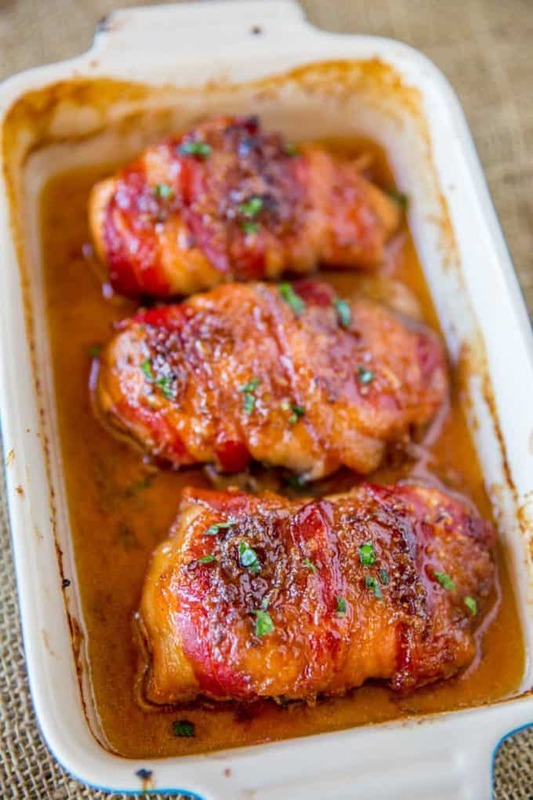 Bacon Brown Sugar Garlic Chicken is a recipe we’ve actually been making at home for years but I never thought to post because it is so closely related to this Slow Cooker Bacon Garlic Pork Loin and Brown Sugar Garlic Pork. If I had to guess, I’d say about 10% of the comments and emails I get from readers are in reference to those two posts above and they’re asking if they can use chicken. YES YES YES. 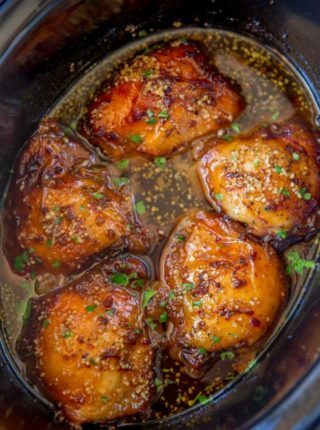 I recently posted Slow Cooker Brown Sugar Garlic Chicken and wanted to post this oven baked version as well (with chicken breast meat!). 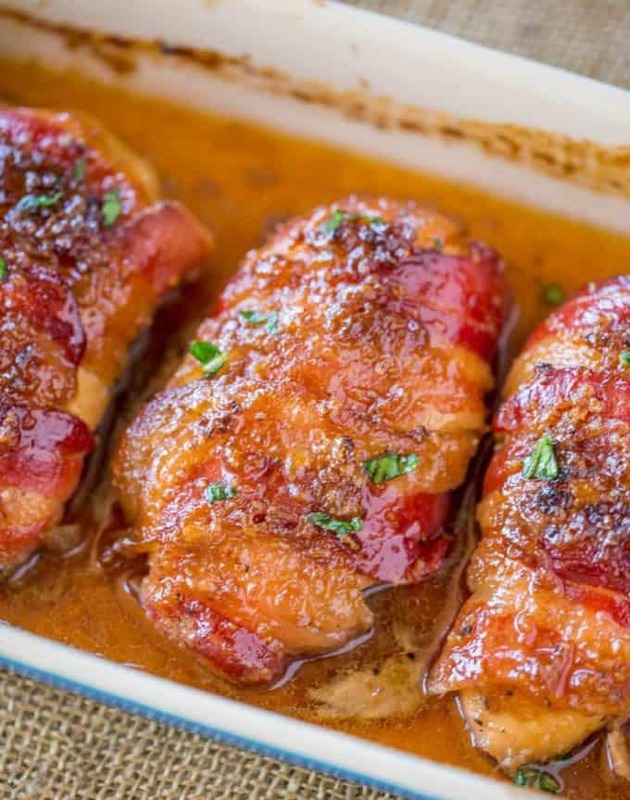 This Bacon Brown Sugar Garlic Chicken is as simple as it sounds. Yes salt and pepper add flavor too (so technically 6 ingredients?) but even without those two, you’ll still have so much flavor it will leave you literally wanting to lick the plate. Looking for more easy weeknight meals? Use a baking pan with at LEAST one inch high sides (my pan is almost 2 inch tall sides). You can see in the pan the sauce gets up pretty high while bubbling, you don’t want it to boil over into the oven. If concerned about this, place a baking sheet under your baking pan to catch overflow (better on the sheet than in the oven). Check the chicken at 25 minutes, you want to catch this when it is browned but not blackened and with sugar that can sometimes turn quickly. Yes, you can absolutely make this meal in the slow cooker (this is coming soon too). Using thigh meat place it in the slow cooker with no added liquids. Want it a bit spicier? Add in 1/2 teaspoon of crushed red pepper or a squirt of Sriracha. Serve with rice or potato wedges and roasted vegetables. 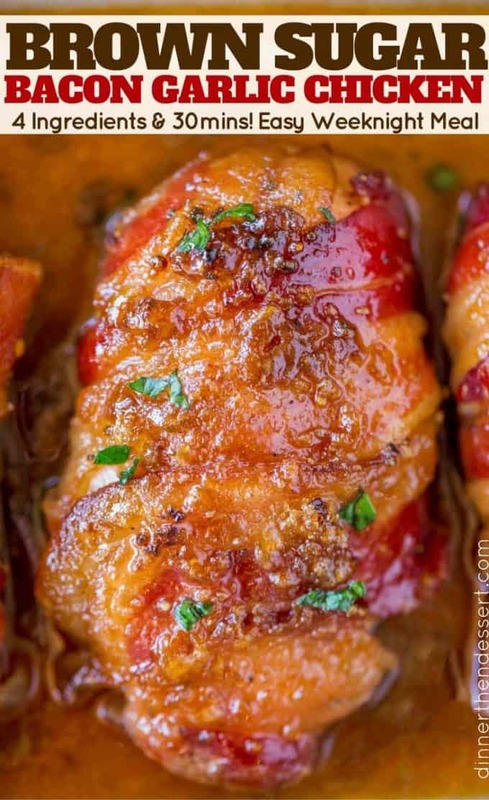 Looking for more awesome Brown Sugar Garlic Recipes? 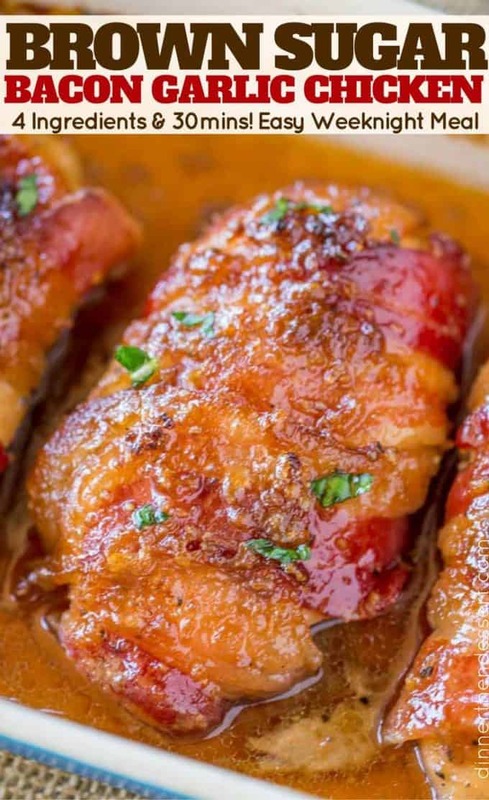 Bacon Brown Sugar Garlic Chicken, the best chicken you'll ever eat with only 4 ingredients. Sticky, crispy, sweet and garlicky, the PERFECT weeknight meal. In a large bowl add the brown sugar, garlic, salt and pepper and mix until combined. Coat the chicken in the brown sugar mixture. 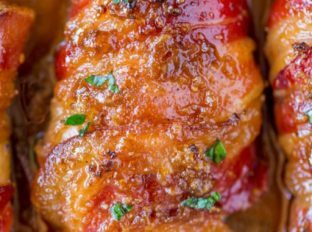 Wrap each piece of chicken with two slices of bacon (aim for the end of the bacon pieces to stay under the chicken to prevent unwrapping while cooking). Place into your baking pan (with at least 2 inch high sides). Top with the remaining brown sugar mixture. Cook at 375 degrees for 25-30 minutes or until cooked through and browned. Careful to not let the brown sugar burn and blacken. I made this for my sweetie the other night and when he came here from work he nearly broke the door down! He said he could smell it from the street and it was wonderful. He absolutely loved it! I only made 3 breasts, they were large, and he gobbled one down in a flash. He took one of the others to work and when he warmed it up in the microwave, he had a lot of folks just walking through sniffing:) This is a keeper. The other chicken recipe I make for him that he loves has only 3 ingredients, and one of them is chicken:) I use 4 chicken breasts, 1 dry package of Hidden Valley Italian Dressing and 1/2 cup of brown sugar. Mix the dressing and sugar in a large plastic bag, shake the chicken in it to cover and let sit in the fridge for at least 2 hours. Then, in a foil lined pan, put in the chicken and all of the juices and cook uncovered for about 35 minutes. So good. He licks the plate:) He did this time, too. Thanks – great recipe! 5 plus stars! Cooking it now… smells amazing. You might put the bit about putting it on a wrack actually in the recipe. Wasn’t until it wasn’t cooking in the stated time that I looked at the comments. Might save you some negative feedback. I’m so glad you enjoyed it! I’d love to see a photo. The easiest way is to follow me on Instagram and use the hashtag #dinnerthendessert when posting. I look forward to seeing it. Would all the other ingredient measurements stay the same when only making 3 chicken breasts? You can use the slider tool (hover over the servings) to adjust the recipe card to show 3 breasts and follow the adjusted amounts for the other ingredients. Hope this helps! You could serve it with mashed potatoes or any type of vegetable. Enjoy! This recipe is amazing! I used maple smoked bacon and the whole house smells incredible. Definitely a keeper. Thanks for sharing. Hi, this looked so good in theory. But we tried it tonight and it was waaaaaaay too garlicky. Almost inedible. And I only used two tablespoons instead of three. Could 3T be a typo, or are there just a lot of people out there who just love garlic? I even watched your video of how to make this recipe, and it looks like you add a lot less garlic than the recipe calls for. I’m going to try it again and add maybe 1/2 TEAspoon instead of 3 TABLEspoons to see if we like it better. Thanks in advance for any advice you may give! I’m sorry it was too garlicky for you but feel free to adjust to match to more of your liking. 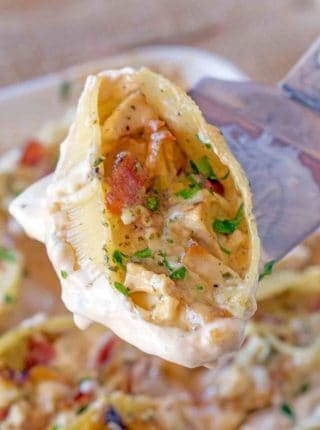 I was searching for a recipe to make for dinner tomorrow and this looks amazing! After reading all of the awesome reviews, I cannot wait to make this for my family ? Can’t go wrong with this!! My boyfriend absolutely loved it. Mine took a little longer (maybe my chicken breasts were larger) to bake. I ended up putting foil over the top halfway through to make sure the chicken didn’t dry out. It was so juicy and perfect! Delicious!!! Also very easy with minimal cleanup. Will definitely be making this again. I really want to make this! Looks so good and easy. 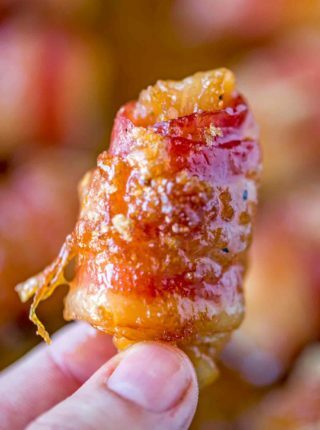 I have a question regarding some folks’ comments about the bacon not being crispy on the bottom. Do you think it would work to brown the bottom quickly in a cast iron skillet and then put in the oven and bake in the cast iron skillet? I recommend baking on a rack or placing some foil underneath the chicken. Both ideas will help it from sitting in the juices that come from the chicken during the cooking process. Good luck! 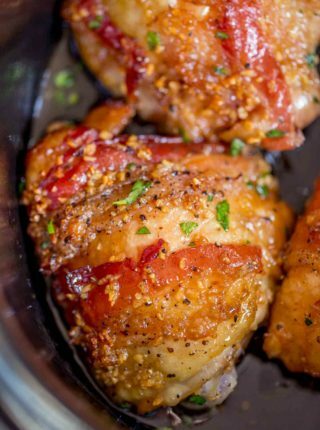 Can I use thighs instead of breast or will it make it too juicy and make my bacon soggy? You should still be ok with thighs. Enjoy! Nervous about the bacon being soggy.How can I help keep it crispy? You can put it on a metal cooking rack or ball up a bit of foil for underneath so the chicken sits up higher to keep it from getting too soggy. Enjoy! I tried this and it tasted good… but the brown sugar mixture just fell off the chicken and the breasts ended up cooking in a soup of chicken water and sugar. the insides of the breasts were very dry. The bacon was delicious … but… how do you make it form like a crust?? Try and pat down the chicken before putting together. That will help get rid of as much liquid as possible to hopefully avoid that happening again. Hope this helps! would this work with turkey bacon for a healthier alternative? No, I’m sorry but it won’t. When I made this recipe, the bacon was cooked thoroughly but it did not get crispy. 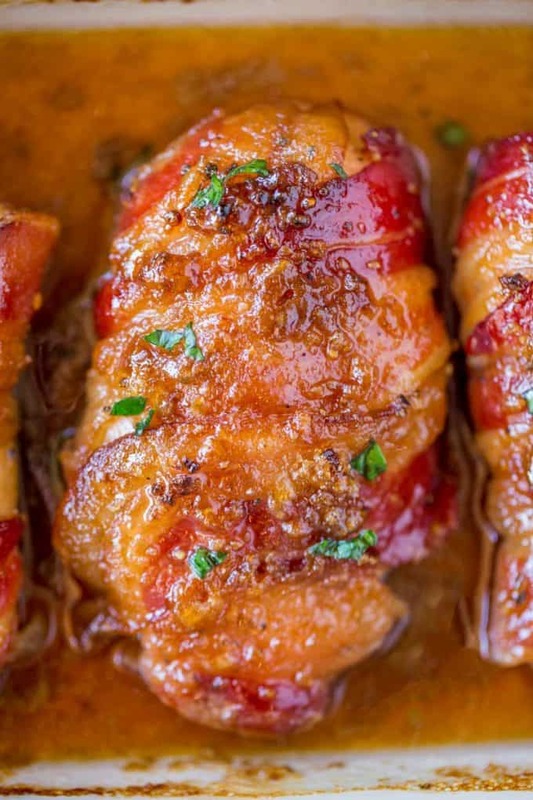 Is there advice you have for getting crispy bacon when wrapped? You can try and cook it on an elevated rack so it’s not sitting directly on the bottom of the pan. Also, try placing it under the broiler for just a bit at the end. Both options should help. Enjoy! I’m cooking it right now!! I use thick bacon so I baked the bacon for about 17-20 minutes 1st… still floppy. Tore the bacon to fit the large breasts I used to cover the top of the breasts so hopefully all the bacon will be cooked and I hope a bit crispy!! Your cook time is a little vague. I don’t see a cooking temperature so 25 minutes doesn’t mean anything. Step 6 states to cook at 375 degrees for 25-30 minutes or until cooked through and browned. Hope this helps! Do you think this will work with skinless chicken tenders? Can you use white sugar than brown? The brown adds needed moisture and clinginess and helps with caramelization. I’d really have to test before giving an okay on regular sugar, but my gut would say no. This was OK but the bacon was extremely soggy on the bottom and the chicken was very greasy. It should be cooked on a rack for sure. I think it’s a good base receipe but lacking something. Yay! I’m so glad you loved it so much to leave a review. Thanks for taking the time, Karen. I made this recipe a while ago and my family went crazy for it. My husband begs for me to make it again, so tonight it is! I’m not a pro chef, just a regular mom and wife, and this recipe came out perfect! You literally just made my evening! How awesome is that! Thank you so much for coming back and letting me know how it turned out! Chicken and bacon takes longer to cook then the time provided chicken generally takes a hour and 20mins and bacon takes 35 to 40mins I put my chicken on baking pan with a cooling rack cooked the chicken a little bit with no seasoning and the brought the chicken out drained the juices from the pan added the seasoning and wrapped 3 pieces of bacon around and I used tooth picks to help hold the bacon together and put extra brown sugar on the bacon to help seal to the chicken and I served it with brown sugar red potatoes with butter and garlic and it turned out amazing. Looks so yummy. Will give it a try. 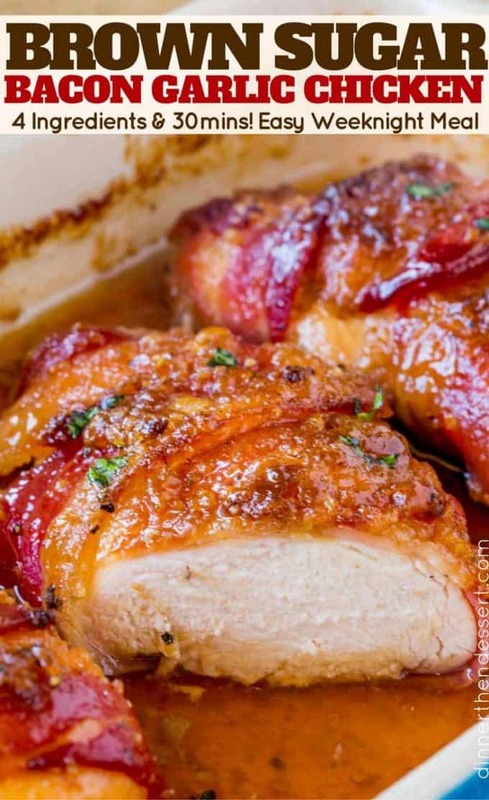 This chicken has a good flavor, but the bacon was soggy and I had to cook the chicken much longer than the recipe called for. I ended up putting it under the broiler for a few minutes to get it to brown a bit. But the bacon never got crispy, and the bacon underneath the chicken (wrapped under) was particularly soggy. Just made this and its not only beautiful, but delicious. Wish I could send a pic. Looks just as good as yours!! Trying this tonight for dinner super excited. Tried a bit different take on this. Cut chicken thighs into 2 inch pieces and used a wok for cooking all ingredients. Used turkey bacon for lower fat but still used brown sugar. Threw in some flakes of red pepper, and people (myself included) added sriracha sauce, to taste. Total hit. Thanks for the suggestions! Sounds amazing! Making it it now fingers crossed ?